White quartz countertops are an elegant, sophisticated way to upscale your home’s current kitchen. But, they’re not just aesthetically pleasing! Quartz is a great material for countertops because it doesn’t harbor bacteria and it resists chipping and staining. Because of this, you can count on your kitchen countertops staying pristine and sparkling white for a long, long time. With the area’s largest selection of in-stock countertops, Southwest Michigan Granite is your go-to source for high-quality, beautiful quartz and granite. From the spotless surface of our aspen-white option to the mottled texture of our white Attica, you can be confident that you’ll find the perfect option to suit – and elevate – your kitchen’s style. For over twenty years, the team at Southwest Michigan Granite has helped homeowners select the ideal materials for their projects. With the aim of truly understanding what you’re hoping to accomplish, we work with you throughout the process, identifying your needs and presenting options that work to achieve your goals. 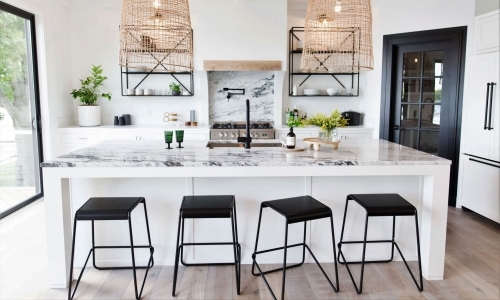 Whether you’re just looking for a visually appealing backsplash or you want to change all of your surfaces to white quartz countertops, we’re here to help. Our team will strive to learn your expectations, review your drawings, and develop a plan that will result in the most stunning, functional, and cost-effective countertops possible. At Southwest Michigan Granite, we take pride in our massive selection of high-quality quartz and granite countertops. Having earned a reputation for stellar customer service, we work diligently to give every customer the guidance that they need to make informed decisions. If you’ve been thinking about redoing your kitchen’s surfaces, we encourage you to take a look at our website, learn about the products that we offer, and contact us with any questions that you have.